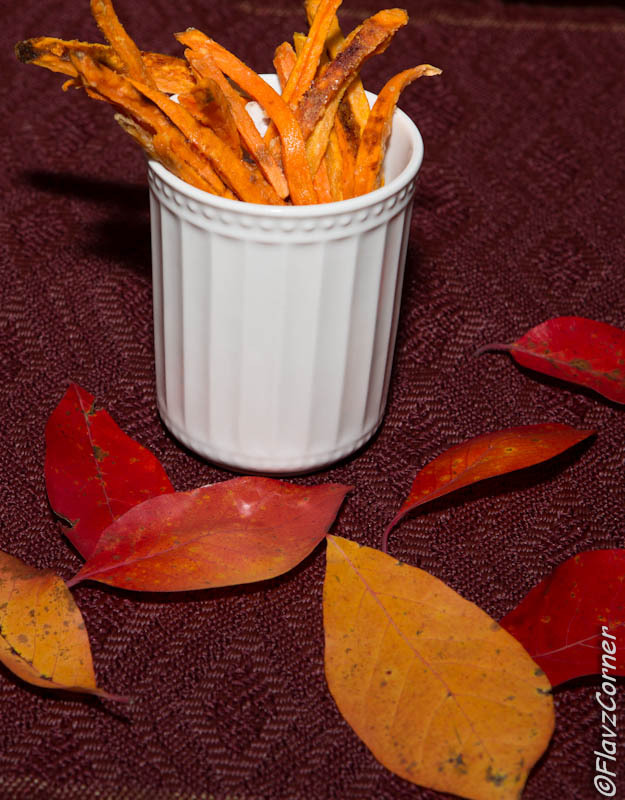 Sweet potatoes are readily available throughout the year which is inexpensive and delicious at the same time. These starchy tubers are packed with Vitamin B6, Vitamin C, Vitamin D, iron, magnesium, potassium and they are known for their high Carotenoid content. Baked sweet potato fries have become a favorite evening snack for my kids. It is easy to prepare and healthy when compared to the fried version. Even though I allude it as a kids snack, we cannot stop munching on it :). 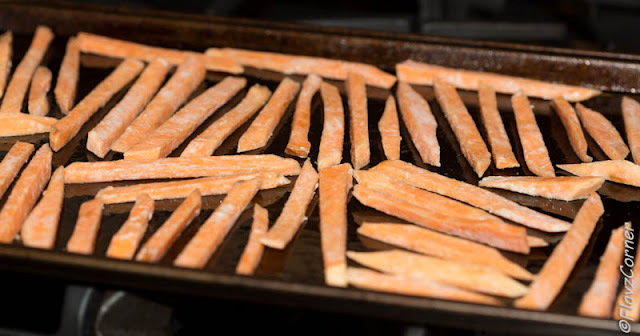 The important tip to achieve crispy fries is to remove as much as starch from the sweet potato by soaking it in water for at least an hour or more. Here are 2 different versions of fries I make. Wash and remove the skin of the sweet potatoes. Cut them into 1 inch thick pieces and soak them in water for an hour. After 1 hr, wash the potatoes couple of times and pat dry them with paper towel, leaving some moisture. Take 1/4th of the cut potatoes in a bowl and add 1 tsp of corn starch and the ingredients you need (sweet version or spicy version) and mix well till all the ingredients are well coated on the potatoes. Place them on a greased baking sheet and drizzle 1 tsp of the olive oil and use your hand to coat them well and arrange them so that they do not touch each other. Bake for 15 minutes and flip the sides and bake for another 5 minutes or more till a crispy texture is attained. 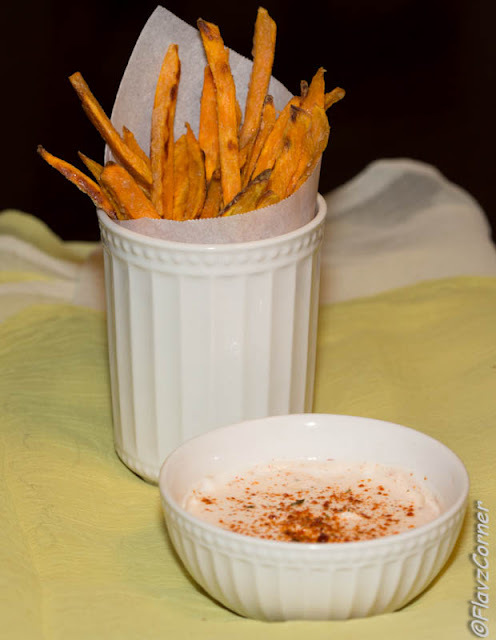 Mix all the dipping sauce ingredients together to make the sauce and serve with the spicy sweet potato fries. I usually bake them in 4 batches. If you prefer the plain sweet potatoes fries, skip the sweet and spicy ingredients and bake it. The longer you soak the cut potatoes, the better the fries will be. Enjoy it while it is warm, it will get soft if it sits longer. Hi Shibi, thanks for stopping by Manila Spoon. Glad to meet you! 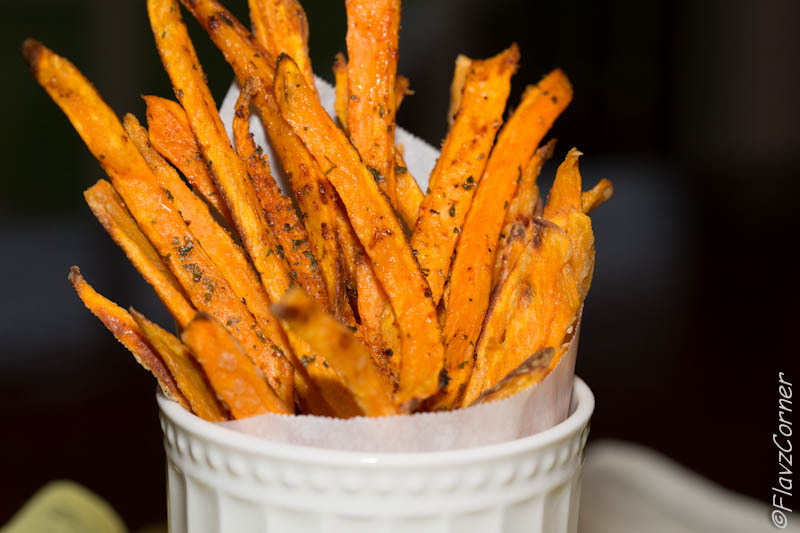 Love your sweet potato fries! They look amazing! I should try this! Hey you seem to be a newbie in Food Blogging.. Welcome to the community !! Thanks Nupur for the warm welcome!!! No need to rush to burker king for this fries, Love the dip.